"There have always been ghosts in the machine. Random segments of code that have grouped together to form unexpected protocols." Rule #1: "A robot may not injure a human being or, through inaction, allow a human being to come to harm." Rule #2: "A robot must obey orders given it by human beings except where such orders would conflict with the first law." Rule #3: "A robot must protect its own existence as long as such protection does not conflict with the first or second law." Hard-wired into the programming of every robot that walks the streets of Chicago, circa 2035, these three laws are the cornerstone of robotics. They insure these technological wonders are committed to the service of humanity, and are not prone to the disastrous consequences that can result from unrestricted free will. In short, they keep citizens safe, and insure future profits. USR (United States Robotics), the leading manufacturer of these mechanical marvels, is set to unveil their newest model, the NS-5. More lifelike and advanced than any predecessor, the NS-5 receives daily software upgrades from V.I.K.I., USR's positronic mainframe. They promise to improve the quality of life, but one man remains suspicious. An admitted cynic, detective Del Spooner (Smith) is wary of the robots' unfettered good will. Scarred by his past, he is suspicious of any robot, expecting the monsters to turn on their creators at any moment. To a society that has accepted robots into their daily lives, Spooner's skepticism is pure paranoia bordering on mental illness. Spooner is more of the retro type, sporting vintage Converse All-Stars while listening to his antiquated, remote-control operated stereo. He appreciates the benefits of technology, but prefers his gadgets without personality subroutines. Spooner's suspicions seem justified after a close friend and head developer at USR, Dr. Alfred Lanning (James Cromwell), is found dead. An apparent suicide, Spooner suspects a robot is responsible. Dr. Susan Calvin (Bridget Moynahan), a "robot shrink" employed by USR, dismisses the claim as absurd. Assigned to assist the detective, the alluring but disconnected scientist defends the three laws and the countless contributions robots make on a daily basis; to her, the idea of a robot committing murder is simply impossible. However, after Sonny (Alan Tudyk), a "unique," emotion-filled NS-5 is discovered near the crime scene, Spooner's theory doesn't seem so farfetched. As events unfold, it seems the "ghosts in the machine" are becoming manifest—an event that spells disaster for the creator, and power for the created. I, Robot, helmed by Dark City vet Alex Proyas, is a surprisingly successful blockbuster. Though merely "suggested" by Asimov's thoughtful source material, the script provides a fine balance between the author's original ideas and the requisite action set pieces. There are some engaging themes to be had, addressing the nature of humanity, free will, and the danger of technological dependence. Some may find the script's loose grip on Asimov's novel akin to blasphemy, but for a summer action picture that promises enough explosions to blow away one's synapses, the substance here is nothing short of shocking. The film has a refreshingly sunny disposition. Proyas decided to veer away from the dark overtones of his previous work, instead opting for a brighter, more realistic aesthetic. The result is a detailed, convincing sci-fi world that blends elements of past and future, and dazzles with stunning visual effects. Patrick Tatoupoulos' production design is nothing groundbreaking, but his impressive designs retain a welcome sense of functionality and plausibility. Noteworthy are the creepy qualities of the NS-5s, whose faces share the same rubbery visage as your average CPR mannequin. The cast is solid, led by wisecracking blockbuster vet Will Smith. With an arsenal of one-liners, Smith's Spooner is refreshingly brainy here, depending on actual detective work as much as his gun-toting skills. Smith's charisma really carries the piece. Supporting players, including Bridget Moynahan, Bruce Greenwood, and the wonderfully nuanced Alan Tudyk (whose performance as Sonny was meticulously replicated in CGI), deliver when called for. Proyas' outing is an uncommon sci-fi blow-'em-up. This is no Blade Runner, but I, Robot manages to provide both stylish thrills and engaging ideas. Image Transfer Review: The anamorphic 2.35:1 image is top-notch. Colors and contrast are solid, and detail is high. This is a clean, impressive transfer—to be expected for such a high profile, recent film. Audio Transfer Review: The Dolby and dts 5.1 tracks are not as active and detailed as one may hope, but they still offer a thrilling aural experience, complete with impressive surround effects and deep LFE. Marco Beltrami's effective score is well represented. Extras Review: This new "All-Access" edition comes on the heels of the initial barebones single-disc release. Intriguingly, viewers outside of Region 1 got this special edition right off the bat, but we North Americans are forced to double dip if we want the goods; a somewhat shrewd business move on the part of Fox. Disc 1 includes three commentaries. Track one, featuring director Alex Proyas and screenwriter Akiva Goldsman, is the same track that was included on the original release. Track 2 contains comments from production designer Patrick Tatopoulos, Editor Richard Learoyd, Visual Effects Supervisor John Nelson, Associate Producer John Kilkenny, Animation Supervisor Andrew Jones (Digital Domain), and Visual Effects Supervisors Brian Van't Hul (WETA Digital), Joe Letteri (WETA Digital), Erik Nash (Digital Domain), Dale Fay (Rainmaker), Lead CG Supervisor Eric Saindon (WETA Digital), and Compositing Supervisor Erik Winquist (WETA Digital). Whew. Thankfully, a narrator tells us who is talking at any given point. Finally, Composer Marco Beltrami offers comments on an isolated score track. Unfortunately, his words sometimes overlap with the music, but he does a decent job setting up the cues so we can enjoy them without interference. No major complaints with these tracks; each person offers their own respective info, painting a complete portrait of the film's production. 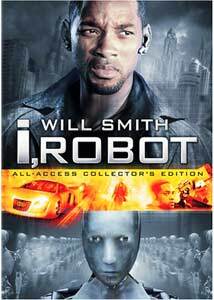 Disc 1 also contains the fluffy, clip-heavy The Making of I, Robot (12m:35s), included on the previous release. You will also find a still gallery of production artwork and photos (30 total), plus a trailer for X2: X-Men United. Disc 2 is packed with around four hours of material. Navigation is somewhat confusing at first; I'd recommend utilizing the on-screen index instead of the Play All feature. This allows you easy, unencumbered access to each section, allowing you to select what you want to view. If you play everything together, you're occasionally presented with a new menu screen that allows you to view various other bits on the disc that are related to a segment you just viewed. This can seem disorienting and random for some. We begin with Day Out of Days: The I, Robot Production Diaries, which is a candid behind-the-scenes look at the film's production, utilizing on-set footage and interviews. The nine sections are as follows: Spoonerville, Canada 2035 (10m:44s), USR (15m:52s), Following Bread Crumbs (08m:25s), You Are Experiencing a Car Accident (07m:33s), One on One (09m:03s), Lost & Found (10m:27s), Will Smith's Night of Thunder (16m:40s), Will Smith's Wild Ride (12m:31s), and Conclusion (04m:36s). Each of these segments breaks down into further bits in the index, and is preceded with a brief intro by the director. CGI and Design (35m:34s total) covers the conceptual and visual effects work on the film. Sections include Alex Proyas: Designing I, Robot, Designing the City, Designing Sonny, Shooting Minatures, Learning to Walk, and Integrating Live Action & CGI. These segments include revealing behind-the-scenes footage and interviews with the visual effects team, production designer Patrick Tatopoulos, and more. Sentient Machines: Robotic Behavior (35m:58s total) is a essentially a short history of robotics. Participants include current scientists, who all confess their inspirations, which range from Star Wars to LEGOs. Even futurist Syd Mead and illustrator Ralph McQuarrie offer comments. Sections include Alex Proyas: The Science Behind I, Robot, When Scientists Dream, Automata to Tortoises, Top Down, Bottom Up, Swarm, Inside Outside In, and When Machines Dream. Three Laws Safe: Conversations about Science Fiction and Robots (31m:22s total) covers the history of robots in fictional stories, the development of I, Robot's screenplay, and the man behind the idea, Isaac Asimov. Sections include Alex Proyas: Science Fiction, Jeff Vintar: Isaac Asimov and the Legacy of Robot Stories, Jeff Vintar: Asimov's Three Laws and Beyond. Akiva Goldsman: This Version of I, Robot, Robyn Asimov and Jennifer Brehl: Isaac Asimov. It's nice to see comments from Asmiov's daughter and editor here, paying proper tribute to a true master of the genre. All of the aforementioned documentaries on Disc 2 are presented in anamorphic widescreen. The Filmmaker's Toolbox contains some additional bits. Four deleted scenes (06m:39s total, nonanamorphic 2.35:1) are included, entitled "Basketball," "Hilltop: 'I Miss You Old Man,'" "Alternate Ending: Original Scripted Ending," and "Alternate Ending: Current Ending Ver. 01 - Pre Vis." Finally, you will find loads of compositing breakdowns, or visual effects "how tos" that show a clip with various stages of compositing, ending in the final, finished shot. Digital Domain offers 11 "how-tos" (06m:59s total), WETA Digital offers 16 (04m:53s total), and Rainmaker offers 8 (05m:32s total). You can get a good feel for which effects house worked on which shots, providing a glimpse into the collaborative process that went into the film's CG work. Enough extras for ya? Seriously, I can't imagine a more comprehensive DVD for this film. This is a good quality, substantive set. Alex Proyas' sci-fi blockbuster manages to balance style with some Asmiov-tinged substance. This is a fun ride that will exercise the brain from time to time. Fox's special edition is simply packed with engaging extras that any sci-fi fan will dig. Highly recommended.